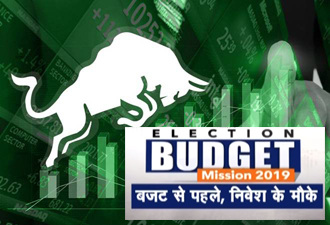 Union Budget 2018 is nearby and expectation from budget very high. This year Government is likely to focus on rural, agriculture and infrastructure sectors in budget 2018. In addition to that economic reform and job creation shall be major focus areas for the Budget 2018. The stock market is at all-time high and likely to continue rally in 2018, mainly due to political stability and ongoing economic reforms. 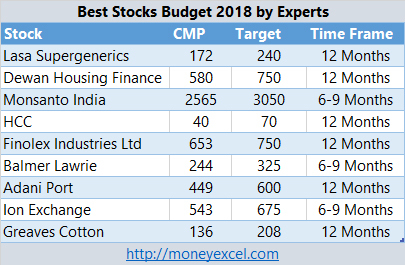 If you are looking for best stocks for investment before Union budget 2018-19, here are 9 best stock suggested by CNBC Awaaz experts Sandeep Jain, Avinash Gorakshakar and D.D.Sharma. The first stock pick is Lasa Supergenrics. Lasa Supergenerics is animal husbandry sector stock. This stock was listed in September 2017. It is small cap stock with very good earning potential. The fundamental of the company is good and company has posted very good results. This stock is likely to get benefit from the budget announcement on the agriculture sector. The second pre-budget stock pick is Dewan Housing Finance. Dewan Housing finance is dealing in housing finance sector. The logic behind the selection of this stock is increasing the focus of the government on the affordable housing sector. The stock is available at an attractive valuation and expert suggest that one should invest in the stock. Monsanto India is next stock pick by the expert. Monsanto India is agrochemical sector stock. A focus of the government on agriculture sector is likely to give benefit to this stock. The fundamental of the company is good and as per expert, this stock will give good return in the future. HCC is next stock pick by the expert. HCC is one of the oldest company in the infrastructure sector. The focus of the government on infrastructure sector will give benefit to this stock. HCC enjoys strong order book. The company is reducing debt which will increase the revenue of the company. Finolex Industries is biggest PVC pipe manufacturer of India. Finolex is an independent company they produce their own raw material for manufacturing of pipe. The demand for PVC pipe is more in the rural sector due to irrigation. The company is increasing manufacturing capacity. Balmer Lawrie is next stock pick by the expert. Balmer Lawrie is dealing in multiple products. It is very good mid-cap stock for the investment. It is a debt free company and performing well. The company is holding Mini Ratna status and available at very good valuations. Adani Port is next pre budget pick. The government will increase export trade. In order to do that government may reduce MAT (minimum alternate tax). It will give benefit to SEZ like Adani Port. The company is performing well and valuation of the stock is reasonable. One can invest in the stock. Ion Exchange is in water treatment and environmental solution. It is a small cap sector company. The focus of the government on water treatment and swacch bharat will benefit this stock. The fundamental of the stock is good. A company is also exporting products to other countries. Overall it is a good stock for investment. Greaves cotton is last stock pick. Greaves Cotton is Indian engineering company that manufactures engines and heavy equipment. The company has recently changed focus to the rural area. A company is now manufacturing farm equipment like pump set and tiller. Overall company has well established business. A strong balance sheet and debt free status is added advantage. What’s your opinion on overall mkt now after budget? Market is likely to remain down till April 2018. Post April, market may move up based on global market condition.